Maxi dress by Frock and Frill, Chiffon fabric, Crew neckline, Heavily embroidered top, Sequin and bead detail, Thigh split, Zip back fastening, Regular fit - true to size, Hand wash, 100% Polyester, Our model wears a UK 8/EU 36/US 4 and is 169 cm/5'6.5" tall. 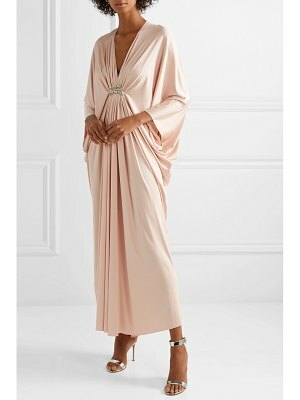 Channelling a vintage vibe with a covetable collection of party dresses and glamorous separates, Frock and Frill mixes runway inspiration with art deco detailing for a truly unique style. With a fresh, feminine approach to fashion, expect shift dresses, maxi styles and cami tops with intricate beading and sequin embellishment"